This photo was taken in approximately 1896. Standing in front of the Tribune office from left to right are Roy Babcock, Eri Babcock, Mrs. George Babcok (Helen Babcock in front), George Babcock (publisher), Hazle Babcock, Grace Babcock, and (Let) William Brooks. 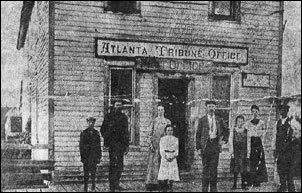 From 1899 to approximately 1910 the Atlanta Tribune was located where Chatter’s Starting Line now stands on Main Street in Atlanta. G.M. Babcock was acting as publisher at that time. Pictured above is a photo of the Montmorency County Tribune burning in 1943. At that time the paper was owned by Mr. and Mrs. Frank Weber. After the fire, a new building was built, pictured here in the January 6, 1944 edition of the Tribune. The Tribune was established on June 30, 1886 and is currently a 4,200 circulation weekly newspaper published every Wednesday. A lively, well-read, county-seat paper, it gives solid coverage of Montmorency County and many weekend property owners and others with an interest in our area. The founding editor of the county seat newspaper, which was called the Atlanta Tribune, was Andrew J. Taylor, who was a local druggist. A subscription to the paper cost $1 per year and the first edition, front page featured a lengthy story about “A Night of Horror - M. Oulfe Masquerading as a Werewolf.” It is interesting to look at what were newsworthy stories back then. There is a copy of the first edition of the Tribune, framed and hanging in our front office for customers to enjoy. Mr. Taylor did not keep the paper for long, and a new editor, A.J. West, took over as editor in 1888. Then in 1889, G.M. Babcock was named the new publisher and ran the paper for several years. S.E. Evens was his editor from 1910 to 1911. At that time, the newspaper was located in a frame building where Chatter’s Starting Line is now located. Back then, printers would handset the newspaper by picking each letter from trays of type and placing the type up in galleys to form the stories. Once the paper was printed, all the letters were returned to the trays to be used again the next week. It was much more time consuming than the way it is done now, but the printers were very fast at setting the type. There were many changes of ownership in the late 1910’s and 20’s. In 1918 the Atlanta Tribune merged with another local newspaper and became the Montmorency County Herald and Tribune. The newspaper was once again reorganized in 1922 and was named the Montmorency Herald and was published by William J. MacQueen and Son. In the late 1920’s, Frank F. Weber purchased the paper, and it became The Montmorency County Tribune. Mr. Weber was the editor of the paper, and he and Hazel Weber ran the paper through the 1940’s. In February of 1943, the Tribune office, plant and print shop were destroyed by fire. The building and all of its contents were a complete loss. In the February 11, 1943 edition of the Tribune, articles were reprinted from the Gaylord Herald Times and Cheboygan Tribune, in which Mr. Weber stated that the fire started some time during the noon hour. His linotype operator, Guy Trower, who was from Cheboygan, returned from lunch, and as he opened the door to the building, smoke poured out and soon flames were eating through the walls. Earlier in the day, Trower had been preparing to set the type on the lengthy annual state advertisement of delinquent tax sale property in the county. He managed to enter the building and save the list, but could not save anything else. 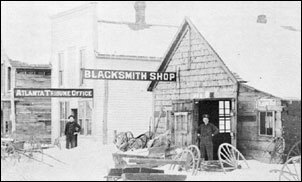 An article from the Alpena News stated that when the village fire truck arrived on the scene, it refused to work, and a half hour elapsed before even a small stream could be played on the fire. Soon the building, one of the early structures of the village, used successively as a dwelling, a hotel, a saloon, a store, a skating rink, was a heap of smoking ruins. 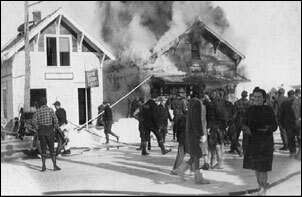 For a few weeks following the fire, Mr. Weber produced a mimeographed paper, then had the paper printed at the Cheboygan Observer office, which was owned by his brother Al. 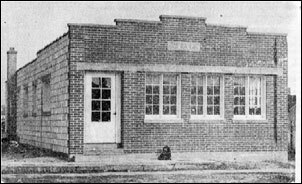 A new facility was built and equipped and by 1944 the Montmorency Tribune was up and running on its own again. After World War II, John Weber and his father published the paper, until Frank died. John converted the paper plant from letterpress to offset press, and published it until 1977, when he sold it to Tom and Carol Young, who came from Minnesota. Mr. Young was editor and publisher for 29 years. The Youngs had a larger facility built in 1979, which is the current site of the Tribune. In 2005 they replaced the old newspaper press with a Goss Community with a UOP color unit, which allowed full color to be added to the paper. In 2006, the Young’s sold the Tribune to their son, Jim Young and long-time employee, Bill Pinson. The partners were the publishers together, with Jim acting as editor, and Bill in charge of printing. In 2010, Jim Young left the business to pursue other avenues. Currently the Tribune is published by the Montmorency Press, Inc. and owned by Bill Pinson. His wife Michelle is the editor. In addition to printing the Tribune on a weekly basis, we print newspapers for others, as well as offering a full line of other printing services, office supplies, copy and fax service, and much more.